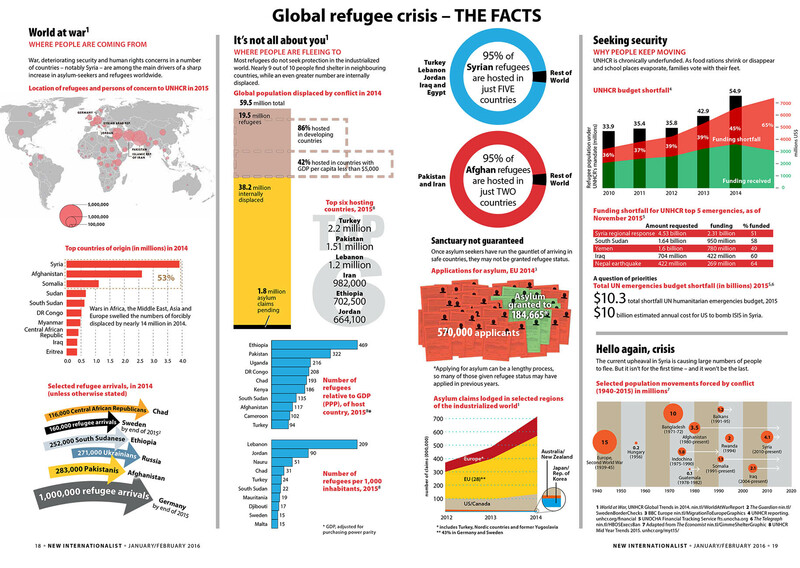 There are more than 15 million refugees around the world. 15 million people who have been forced to leave their home country in order to escape war, persecution, or natural disaster. An additional 38 million people are also escaping their home but remain “internally displaced,” resettling or moving inside their country’s borders. In addition to the rising numbers of refugees and internally displaced persons (IDPs), this year marked the closure of two very different refugee camps. One camp–in France–is the last stop for many Arab and African refugees seeking to make their way to the UK. Another camp–in Kenya–has become the largest refugee camp in the world after its creation 25 years ago. These two camps, both closing in 2016, point to the tremendous failure of the global community to help refugees find peace. Last week, French authorities cleared “the Jungle,” a refugee and migrant camp that the New York Times has called “a symbol of Europe’s faltering efforts to handle its migration crisis.” The French government planned to evacuate residents of the encampment in 170 buses, with the intent of resettling the migrants in different regions of France. 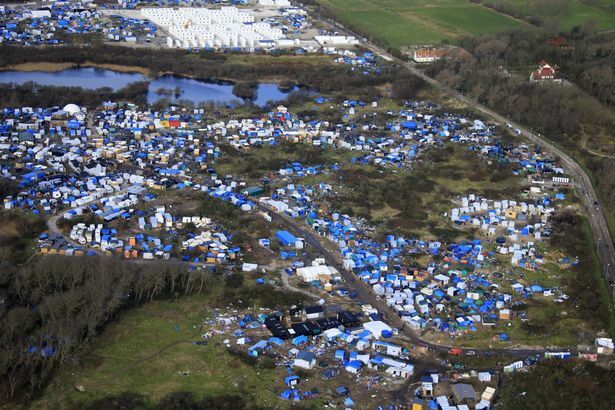 Many living in this camp attempt to illegally enter the United Kingdom via the Port of Calais or the Eurotunnel by stowing away on lorries, ferries, cars, or trains traveling to the UK. There were over 7,000 migrants living in the Jungle, mostly from Eritrea, Somalia and Syria. 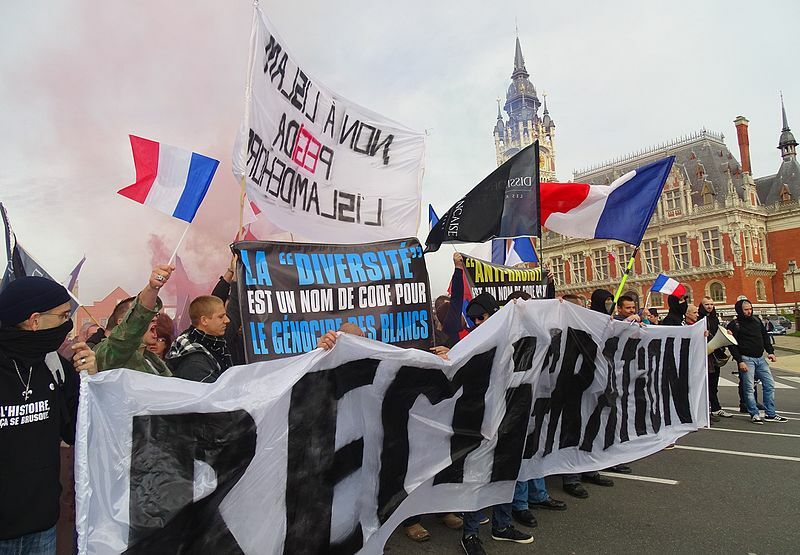 Most of the refugees do not speak French, and are attempting to enter the British labour market to work rather than claim asylum in France. Since 2014, more than ten thousand people have died in the Mediterranean Sea en route to Europe, including nearly four thousand this year. Amnesty International has named it “the world’s deadliest sea crossing.” Those who survive the precarious journey must navigate European countries who do not want them and do very little to help them. When refugees finally arrive to the coast of France, at Calais, they face limited access to water including some showers (sometimes after up to six hours queuing), poor sanitation, limited access to food, and limited heat during cold weather. Substance abuse and petty crime is widespread–not surprising due to the trauma people have faced and the lack of mental health care available to them. Despite pro-immigration movements in many UK communities, the British government has done little to help the situation. The British government has permitted less than 300 children from the camp to reach its shores since mid-October; French president François Hollande is insisting that the UK accept more. Refugees living in the Jungle have been recipients of physical and verbal attacks. Buildings at the camp have also been subjected to arson attacks. Local shop owners have also allegedly discriminated against persons based on their perceived race by forbidding these persons from shopping at their shops. Until Europe sees the refugee crisis as their moral responsibility, there will be sustainable solution. Men, women and children will continue to seek refuge wherever they can. Rather than building more walls that make the journey of a refugee more dangerous, the governments of Europe need to build bridges. Bridges to a better future for all people. Instead, it looks like France has moved everyone and destroyed the evidence. by Ben Rawlence. It is a timely read as Dadaab, the world’s largest refugee camp, situated within the inhospitable desert of northern Kenya, would be closed by the end of 2016, President Uhuru Kenyatta has declared. In May 2016, Kenya announced that “hosting refugees has to come to an end”, that Somali asylum seekers would no longer automatically get refugee status and that the Department of Refugee Affairs, responsible for registering and screening individual asylum applications, would be disbanded. The nation’s Interior Ministry announced it was shutting down the Dadaab and Kakuma refugee camps due to “very heavy” economic, security and environmental issues. 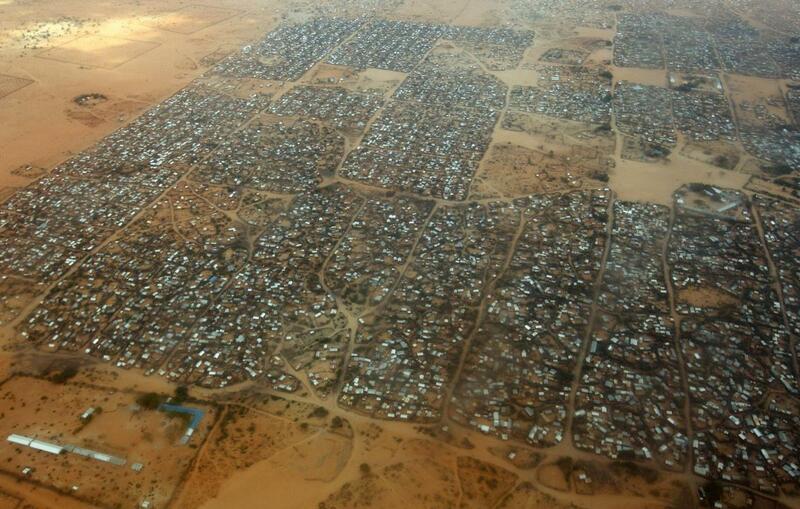 Dagahaley refugee camp makes up part of the Dadaab settlement. Around 185,000 people, mostly refugees from South Sudan, live in the Kakuma camp. More than 350,000 people, mostly Somali refugees, are living at Dadaab camp. Overcrowding and the constant flow of people make exact population figures hard to come by. Dadaab, which is 80 km from Somalia’s border, was set up by the United Nations in 1991 to help Somalis fleeing violence and famine in their home country. Now, 25 years later, thousands of families live in Dadaab with children born in Kenya who have never been to Somalia. Yet, the Kenyan government wants them to go back despite the dangers they will face. Since the start of the so-called “voluntary” repatriation process, a number of refugees told the Human Rights Watch they had returned destitute to destroyed Somali villages without health care provision and schools, or faced danger as armed groups continue to clash in and around their villages, including towns. After doing their best to survive, they fled back to Kenya, once again as refugees. The Kenyan authorities are in clear violation of international humanitarian law, most notably the principle of non-refoulement, which forbids refugees from being returned or expelled to places where their lives or freedoms could be threatened. Human Rights Watch has criticized the repatriation drive noting that repatriation is not voluntary, refugees feel intimidated and refugees are not properly informed. How many of the more than 20,000 Somali refugees who have “voluntarily” returned are now displaced internally in unsustainable and unsafe areas of Somalia because they thought if they didn’t “choose” to go with money and assistance, they would be dumped there with nothing in the next few months? How many of the 1,000 people per day the Kenyan government is now sending back will be heading into danger? asks Human Rights Watch. 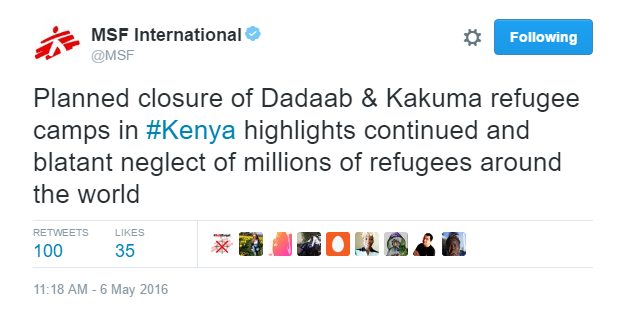 The closure of Dadaab is not just about Kenya. It’s a story of a world that ignores refugees. A world that doesn’t see their plight and doesn’t respond with compassion. The world community, especially the former colonial powers, welcome an incredibly small number of refugees while formerly colonized countries, with far fewer resources, must accommodate waves of refugees from neighboring war zones. After 25 years of slow action by outside nations, Kenya has taken the drastic step of closing all of its refugee camps. Other more durable solutions, such as smaller camps in Kenya, increased resettlement to third countries, or integration of refugees into Kenyan communities, should be urgently considered. Every country needs to take their fair share of the responsibility for helping refugees.